The dark and rich color of red velvet cake recipe gives a simple chocolate cake a very exotic look and taste. There are many versions of red velvet cake recipes but one thing is the same: they all taste great. 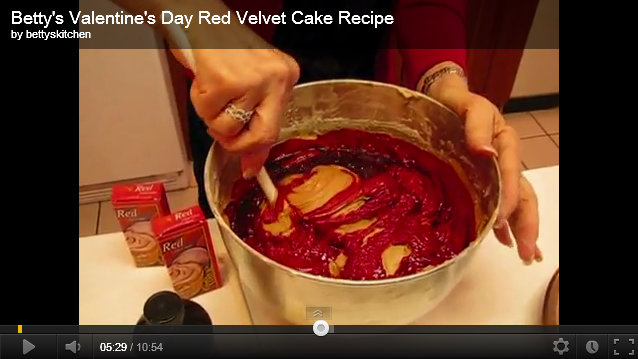 Here is my version of one of the best chocolate red velvet cake recipes from scratch. – Grease and flour three round cake pans. – In a mixing bowl, cream the butter using an electric mixer on medium speed. – Add the sugars to the butter beating well after each addition. – Add the eggs, one by one, to the butter and sugar mix and beat the mix well to incorporate the eggs. – In a separate bowl, sift the flour, baking powder, baking soda and cocoa powder. – Add 1 cup of flour mix to the egg mix alternating with 1/3 cup of sour cream and blend well after each addition. – Now add the flour-sour cream mix to the egg-butter mix, one cup at a time, and blend well. – Add the food coloring and beat well. 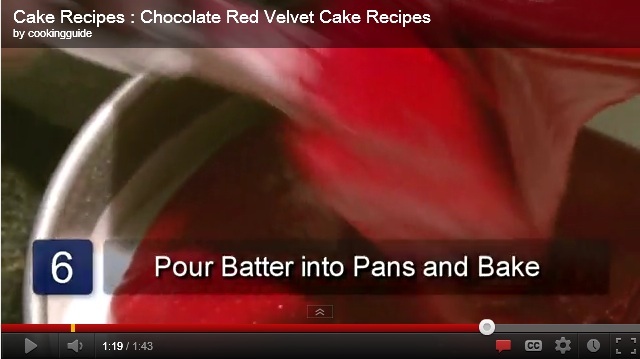 – Pour the cake batter in the greased cake pans. – Bake in the preheated oven for 45 minutes or until the cake layers look done. – Remove from the oven and cool on wire racks before using frosting. Make sure that the cakes are cooled completely before you start icing or frosting. – Melt the chocolates on a double boiler or in the microwave for 2-3 minutes. Mix well. – Remove from the heat and cool completely. – Add the softened cream cheese and vanilla to the chocolate mix and mix well. – Stir in the chopped hazelnuts. – Place one cake layer on a serving stand and spread a thin layer of frosting over it. – Place another layer on top and press lightly. – Spread another thin layer of frosting on the top. – Press another layer on the top. – Cover the top and sides with the remaining frosting. A carrot cake recipe is a great source of fiber, vitamins, nuts and other nutrients and also delicious at the same time. If your kids are giving your trouble when it comes to eating their veggies you must try this simple homemade carrot cake recipe that uses coconut, pineapple, fresh carrots and nuts to provide a whole lot of nutrients. – Grease and flour a 10-inch cake pan. – In the meantime, take the eggs, granulated sugar, brown sugar and vegetable oil in a bowl and whisk well to combine. – Add the sour milk and crushed pineapple to the mix and combine all the ingredients. – In a separate bowl, take the flour, nuts, grated coconut, baking powder, ground cloves, cinnamon, nutmeg and salt and sift all the ingredients well. – Add the dry ingredients to the wet ingredients and combine well. Make sure there are no lumps in the mix. – Add the grated carrots and crushed nuts in last and gently fold the mix and your batter is ready to be baked. – Pour the batter in the prepared cake pan and smooth the top. – Bake in the preheated oven for 1 hour. Once the cake is done a toothpick inserted in the middle will come out clean. – Cool the cake in the pan for about 10 minutes. – Slide a knife along the sides of the cake to separate the cake from the pan and cool on a wire rack before applying icing. 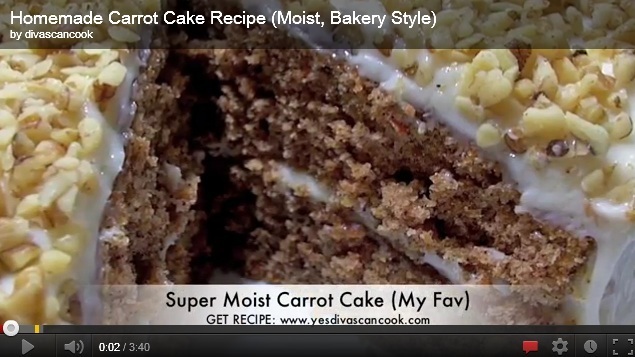 – You can serve the carrot cake as it is or apply a thick layer of icing before serving. Cream cheese icing is most popular with carrot cake, but a simple sugar glaze or a maple sugar icing also gives it a great taste. – Decorate the top of the cake with sliced walnuts and shredded dates and chill for a little white before serving. – Some roasted coconut on top of the cream cheese or butter cream frosting will double the taste of the yummy carrot cake. Cake recipes come in many forms, sizes, shapes, textures and colors. One of the classics is the Red Velvet Cake Recipe. This particular one is made from scratch because it doesn’t have any specialty ingredients, just the regular ones found in regular pantries. The first time I made this red velvet cake recipes from scratch, I was about 11 or 12 years old and I didn’t know then that this was called red velvet cake. My mother had a set of tiny bottles of food coloring (red, blue, green and yellow) and I was planning to use all four on separate cakes. It so happened that I chose the color red first. Subsequently, I also tried the remaining three food dyes and they didn’t quite take as nicely as the first red one. Although the creamy, velvety texture of the cake persists, red does enhance the palatability of the cake. The traditional frosting or icing is white to better magnify the redness of the cake. Of course, baking is such a creative art that you can substitute many other icings or frosting as your heart may desire. For Valentine’s Day, this cake is most splendid, especially topped with syrupy cherries or strawberries. – Prepare a round baking pan by greasing it lightly and sprinkling lightly with flour. – Pre-heat oven to 350 degrees Fahrenheit. – Combine the food coloring and cocoa; set aside. – Cream the oil and the sugar in a mixing bowl. – Add the eggs and cocoa and beat until fluffy. – Add the milk, flour, salt, baking powder and vanilla. – Mix well with a hand mixer on medium speed. – Pour into the baking pan. – Bake for about 30 minutes or until the cake is done. – Cook flour and milk until thickened. – Cream butter and oil until fluffy. – Add sugar and beat again. – Add either cherry flavor or strawberry extract and beat well. – Add the cooled flour mixture. – Continue to beat into a creamy consistency. – Spread evenly on the cooled cake. Every once in a while you want to satiate your sweet tooth with something that is easy to make and tastes absolutely out of this world. 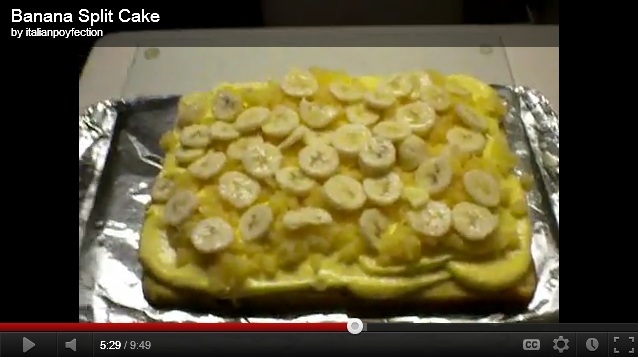 And Banana Cake recipe is perfect for all occasions. Especially in the summers when cold, sweet and refreshing are the magical words, the following banana split cake recipe will fulfill your every need. – To prepare the crumbs, break the crackers in small pieces and run them in a mixer at high speed. Remove from the jar into a mixing bowl. – Add the butter and sugar to the crumbs and mix well using a spoon. – Take a 13 x 9 inch glass dish and press the prepared crumbs onto the dish and push it around the edges. Press to get a smooth and even layer. Be careful around the edges; they should not be thick or thin. – Preheat the oven to 350F and bake the dish for about 5-8 minutes. Remove from the oven and cool. – Slice the bananas into 1/4 inch round discs. – Remove the pineapple from the can, drain them to remove any water and crush them. – Slice the strawberries in thin slices. – In a bowl, cream the butter and sugar until light and fluffy. – Add the vanilla and milk and beat some more. Use an electric blender as it will remove the lumps easily. – Spread the filling on top of the cooled crumb base. – Smooth the top using a spatula. – Chill in the refrigerator for an hour. – Remove and decorate with crushed pineapple. – Arrange the slices of banana on the top in a circular manner. – Top with sliced strawberries. – In a separate bowl, beat the whipping cream to get soft peaks. – Add the confectioner’s sugar to the cream and beat some more to get stiff peaks. – Spread this on top of the fruits and liberally sprinkle with chopped walnuts. – Refrigerate for 4-5 hours before serving. – If graham crackers are not available at your home, you can also use crushed Oreo cookies or vanilla wafers or any other of your favorite crackers. – If fresh strawberries are not available then you can also use strawberry glaze on top of the bananas for the same yummy taste.